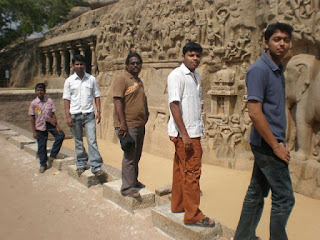 We thought of going to Mahabalipuram for one day trip. It’s quite near to Chennai (60 kms) and the road is quite scenic (not like Bombay-Pune highway of course) but still beautiful in its own way. So after spending the fantastic Friday at office and watching IPL matches (Thanks god, season has started again and we had a winning start this time-My team as always Chennai Super kings. ), we were ready for our trip on Saturday morning. Armed with our dig cam, we started the trip by Morning 8 AM. 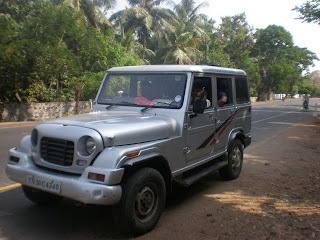 This time we got a beautiful gaadi, nothing but Paul’s amazing Armada Trax. The parts of the road are quite beautiful, with a lovely view of the sea lined with coconut trees, casuarinas trees, fishermen’s villages, catamarans neatly arranged along, or just plain beach sand……and nothing else. 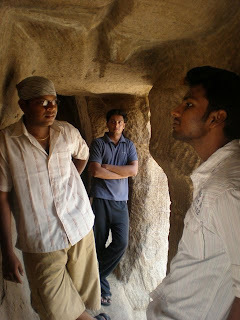 (From right to left: Vijay, Siva, Paul, Ganesh, Hari) Photo by Sai. Every rock out there seems to tell a story, of either an unfinished ratha in the making, or a rock getting split up indicating quarrying of granite in these areas. 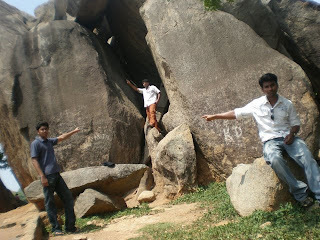 The rocks speak of the methods used in the ancient times to carve chariots or architectural forms out of them. Deep grooves are made into the rock surface and then the rock is split up. Either the rock is taken else where to build a structural temple or a sculpture or just left aside incase it’s an extra. After shooting lots of pics, we had Slice and then moved toward other major attraction, which is Arjuna Penance. 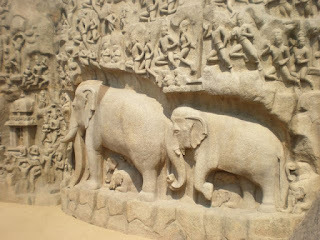 : It is the world's largest bas relief measuring 27m X 9m. What to tell?? They are very photogenic!! We rounded up the lunch with special meals and cool drinks. That was the perfect end. A must for everyone. All this for 200 bucks, totally worth its money. Nice write ups man....I dint know you are this good...Keep writing!!!!!!!! !